Since returning from our vacation, I’ve been obsessed with wine grapes. Dennis eyes me suspiciously and says “no wine making, seriously, for heaven’s sake.” And I don’t intend to become a winemaker, but I do like to blend wine grapes into fruity, tasty grape juice. How could I help but be inspired when we spent the night in the hills above Ribeauvillé, on the recommendation of TrufflePig. 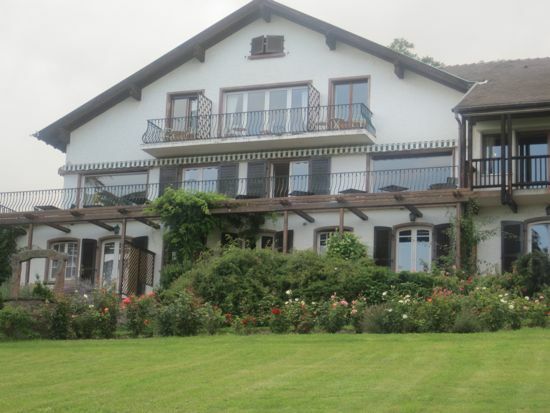 This charming hotel, Le Clos Saint-Vincent, was a former cloister. The rooms were charming and very very French, with small brick private terraces and an incredible setting in the hills. 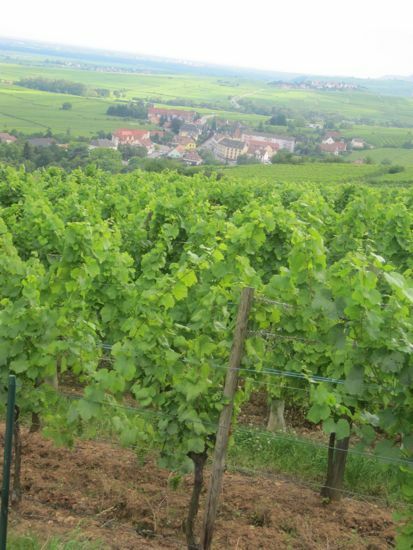 We walked behind the hotel, finding a mirabelle plum tree, two apple trees, rose bushes, and then nothing but wine grapes as far as the eye could see. A stunning view, interrupted by medieval Alsacian villages replete with red roofed homes, churches and cobbled narrow streets. 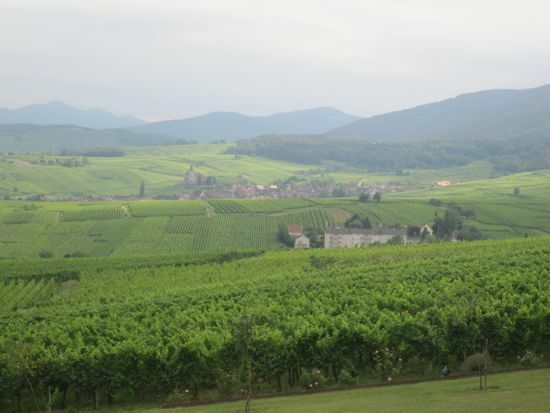 The Alsatian Wine Road, the Routes des Vins stretched out before us. Overflowing window boxes. Winstubs. Wine caves. Everywhere we looked the grape was celebrated. So when we returned from our trip and at the first weekend’s farmer’s market I stumbled upon a farmer selling wine grapes, I knew I had to make juice. I’ve made this juice for the last three years. It’s no bargain unless you have your own grapes. But it’s delicious. And Dennis loves it. If I had a sunny, critter-free spot in the garden, I would plant a grapevine. We just love grape juice. It’s full of antioxidents. There’s no sugar. Just grapey goodness. It couldn’t be easier. 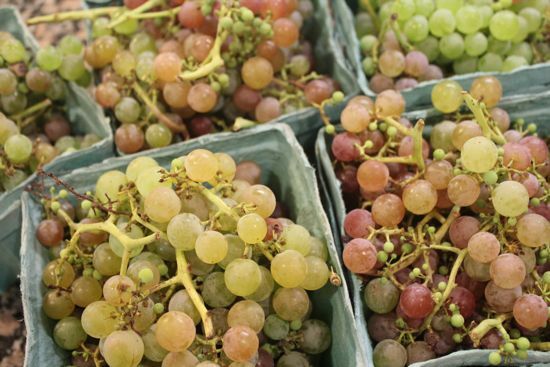 Find or pick eight quarts of wine grapes. All one kind, or a mix. I asked one farmer what kind of grapes he was selling and he shrugged. 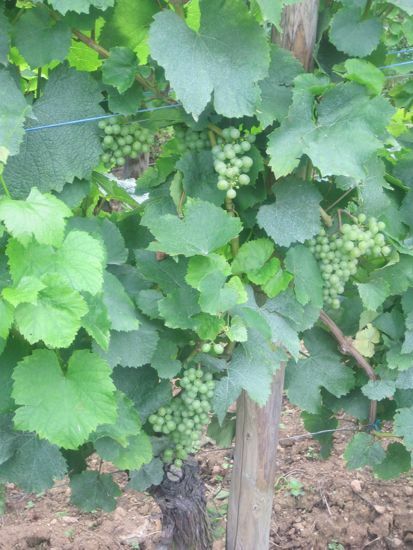 The vines were planted by his great grandfather, brought from Italy. 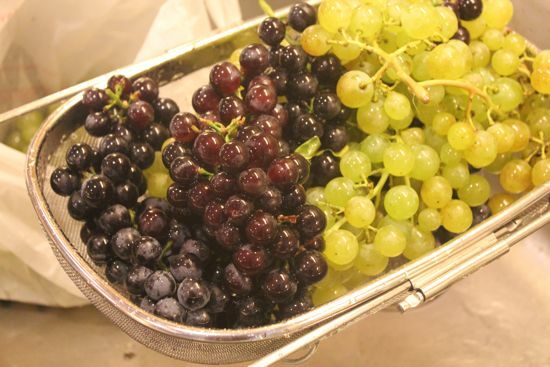 They are all of suspicious and tasty origin, and any wine style grape will make delicious juice. Taste before you buy and make sure they’re fully ripe. If they are too tart, you may choose to add sugar or honey or maple syrup. I never have. Not once in several years of grape juice canning. This is the grapiest grape juice you’ll ever taste. Packed in these perfectly sized 12 oz jars, they’re adorable, right? and incredibly satisfying icy cold. Sure, you can use it to make sorbet, or reduce it to a syrup to ribbon through ice cream. You can add it to sauces and to barbeque swabs. But around here we like it best chilled, and sipped straight from the jar. De-stem all those grapes. Either do this by hand while watching the U.S. Open and get your husband or kids or friends to help, or, (thank you, David Lebovitz for this lifesaving tip) pop them into the bowl of your KA mixer, turn it on low and the grapes come right off the stems. Add the grapes to a deep 8 quart or larger stock pot. Add them one quart at a time, and when two quarts are in the pot, crush them with a potato masher. Continue to add the grapes by the quart and crush them well. When all the grapes are in the pot and crushed, add filtered water until it covers the grapes by one inch. Bring this mixture to a boil, and boil for 5 minutes. 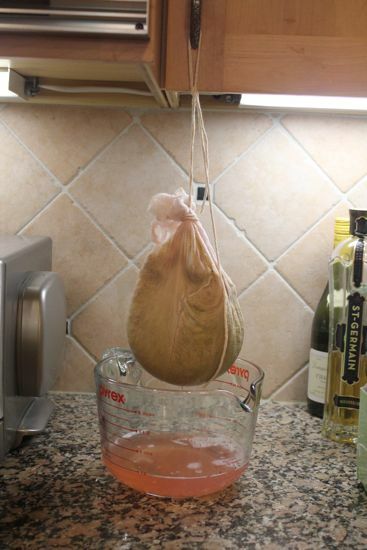 Turn off the heat and allow the juice to sit for an hour to develop. Strain the juice through a fine sieve lined in a triple layer of cheesecloth about 16″ x 16″. Allow the juice to sit overnight in the refrigerator to settle. 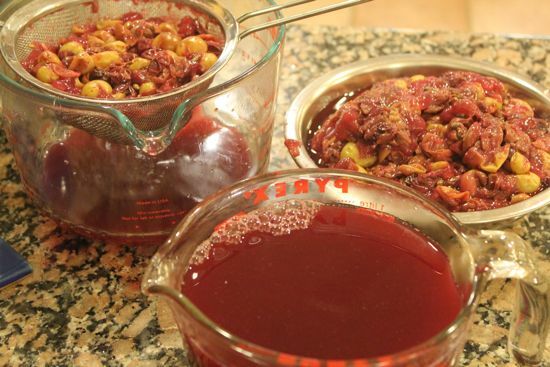 Collect all the leftover grape skins in the cheesecloth and squeeze lightly to extract juice. Form a tight package from the cheesecloth and grape skins and suspend over a bowl. I tied mine to the handles of my upper cabinets. Just allow the juice to flow into a bowl overnight and you might capture an additional two cups of juice. The next day, you can choose to “polish” all the juice, and strain it through a coffee filter, or do as I do and just pour off the juice into a deep stockpot, leaving behind as much of the sediment as possible. My jars of juice have sediment at the bottom, but that doesn’t bother me. 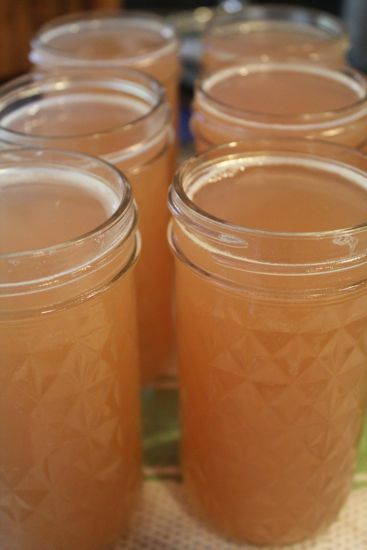 Bring the juice up to a boil and boil hard for five minutes, then pour into sterilized jars, place lids and rings, and process for 10 minutes in a boiling water canner. Grape juice will keep for a year. I can’t wait to try this out! We have grape vines on our property, and much like the guy you met at the market, I couldn’t tell you what kind they are, but some are green and some are purple. I too make gallons of grape juice every year, from our own vines. I guess I do it the easy way. I have a juice-steamer which I use. It makes beautiful clean and clear juice. So easy, when you have lots to do. We are picking this week, so I better get my equipment out and ready to go. I envy your trip, so beautiful. I have a very profilic grape vine in my backyard. I had always thought it was some kind of wine grape because the jelly made from it smelled so “winey.” However, I gave some to my neighbor who makes wine and he said it wasn’t a wine grape, but thought it was a Concord or something similar. It easily produces twelve, 5-gallon buckets of grapes every summer. I often give it away, but your “unsweetened” grape juice has convinced me that I should be drinking it myself. Thank you for the inspiration, Cathy! I always remember what someone told me years ago that grape juice is just about the healthiest fruit juice on earth – and yours looks delicious. What a vacation! I have the hardest time finding good, local, grapes in these parts, but now I’m *dying* for grape juice! just found you blog and loved this first post I read. We live in Brooklyn and the place we rent had a Catawba grape vine growing in the backyard (they planted it there, it just didn’t come w/ the place). This was our first summer in this house and I could NOT believe how many grapes we got.Probably over 15 to 20 lbs in all. It was insanity. I almost was overwhelmed w/ what to do with them. I SO wish I found this post before I made 20 frickin’ cans of grape jam (christmas gift, anyone?). I love all the colors you have – an excellent idea! I’ll remember this one for next year if we are still living here. What a lovely vacation…ah I can dream 🙂 I have never made grape juice and your post is an inspiration to do so. This is a great idea! We live in Ontario and there are wild grapes (or maybe they’re just forgotten?) growing along our local bike path, and it looks like they might just be destined for grape juice! After boiling the grapes and straining them into a large pot, I let them sit in the fridge overnight and poured it through another strainer again in the morning. The juice seemed a little thick so I added some water and poured it into a large pitcher and put it back in the fridge. I’ve been drinking it and it does taste good but theres a little sour bite in there with it. How long can I keep it in the fridge? Should I boil it again and sweeten it? I don’t have those canning jars. I’m worried about getting sick if I don’t do this right. Thanks Cathy. I have a vine in my backyard with wine grapes. I was worried they would be quite sour and was tempted to use a bit of sugar, but the juice is so sweet I need to water it down a little. The only difference in our method was not adding water before boiling. Our grapes were so juicy after crushing them that the liquid was as high as the skins. The juice came out a pretty pink, but a little cloudy. I have no idea what variety they are because they came with the house. All we need now is some nice jars for canning, but I don’t think this first batch will last long enough to bother. Easy, healthy and delicious! Really delighted you liked your juice. For the first time in years, I wasn’t able to process any grape juice last fall. I”m SO BLUE! I miss it terribly and the commercial varieties are either too thick or too sweet and they’re all too expensive. Counting the days until September! I started out canning in 12 oz jars, but at the end it was all quarts. 12 ounces was just not enough. I have gallons of fresh grape juice, very sour. I want to can the juice but would like an idea ,of how much sugar to add to how many cups of juice. Do you have a standard recipe? The grapes I get are so sweet, I’ve never had to add sugar. I think you should take one cup of juice and add 1/2 teaspoon of sugar at a time until it’s sweet enough for you, then do the math. There are 64 cups in a gallon. 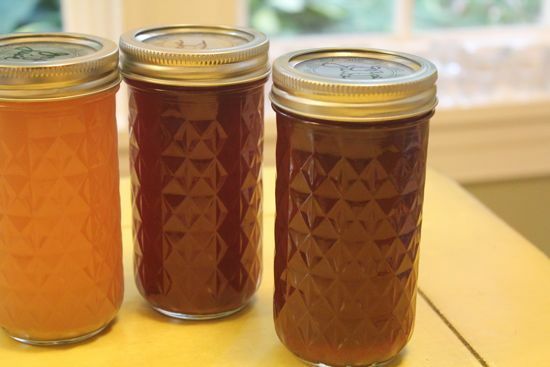 Once you know how much to add, you’ll want to heat the juice so the sugar dissolves completely before canning.